Modeling by ODOT consultants begins to show how the concepts would affect traffic and cost. PORTLAND — A proposal to toll all lanes of Interstate 5 in both directions through the metro area would reduce traffic congestion in that corridor and raise $50 million per year that could be put toward road projects, according to an analysis by WSP USA. Consultants with the New York-based engineering and management firm said they favor that option — over four others they have analyzed — as a way to prove to area drivers that tolling all lanes with a congestion-based price improves traffic flow. The recommendation was given Monday to an advisory committee studying options to relieve congestion in the metro area. The proposal would involve tolling all northbound and southbound lanes of I-5 between Going Street and Multnomah Boulevard. That concept "provides that best opportunity" and could be done relatively inexpensively as a pilot project, said David Ungemah, a consultant and vice president with WSP USA. The I-5 corridor "has a lot of congestion that occurs through multiple hours of the day," Ungemah said. "We already see tremendous amounts of diversion due to that congestion, but there is a good presence of different types of transit services available in that segment of the region, as well as connections into high-demand activity centers, such as the Lloyd Center and downtown Portland." Choosing that proposal would "give some assurance that congestion pricing can work at reducing congestion, meeting the objectives, as transparently evaluated by not only ODOT but also its regional partners," he said. If successful, the Oregon Transportation Commission could expand tolling to all lanes of I-5 and Interstate 205 through Portland, which is another one of the five options that have been modeled by the consultants. Under their modeling scenario, the cost to a driver — if both interstates were tolled — would average about $1.39 per day, depending on the length and location of their commute. 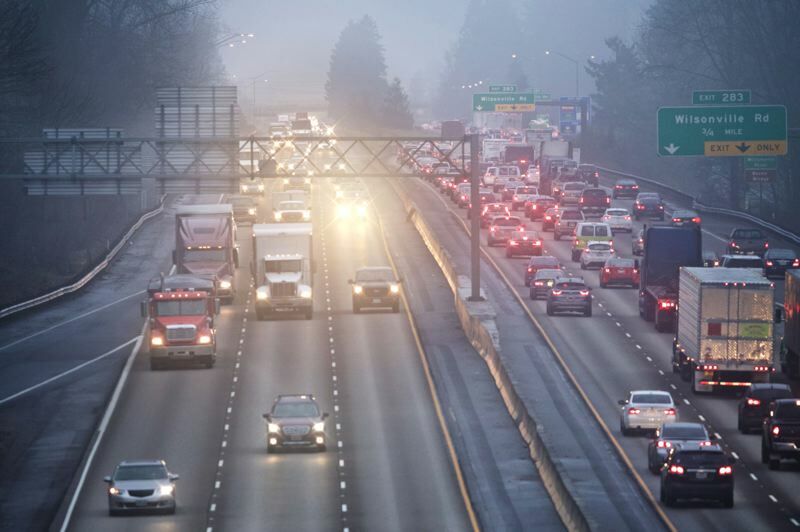 The average daily cost would increase to $2.02 if only the I-5 lanes were tolled. The more lanes that are tolled the less expensive operating costs are to toll each lane, the consultants said. They also recommended that the committee continue to consider a toll on the I-205 Abernathy Bridge to help pay for the cost of adding a third lane on the bridge. A toll of $3.50 to cross the bridge would yield about $50 million per year to cover the costs of adding the third lane, according to the consultants. They recommended eliminating two other options because those scenarios wouldn't produce the results the committee is seeking. The first would convert the left northbound high-occupancy vehicle lane the left southbound general purpose lane to a tolled lane through the Portland area. "The problem is that the Abernethy Bridge is still going to be a bottleneck in that scenario, and that bottleneck is going constrain conditions both on the general-purpose lanes as well as on the express lane, which makes that concept not quite as viable as we were hoping for," Ungemah said. The second option the consultants want to eliminate would apply a variable toll on a single, newly-constructed, left lane between Highway 99 East and Stafford Road, including the Abernethy Bridge. The Oregon Department of Transportation hired the consultants to assist a policy advisory committee charged with recommending a tolling plan for I-5 and I-205. The 25 committee members — who heard the results of the analysis during a meeting Monday, May 14 — have not committed to any of the five options the consultants analyzed. The committee also isn't restricted only to those five options. A $5.3 billion transportation-funding bill passed last year requires the state transportation commission to consider tolling in the Portland metro area but does not mandate it. The advisory committee's recommendation to the transportation commission is due July 12. Transportation commissioners have until December to send a proposal to the Federal Highway Administration, which would need to approve any plan. Working through approvals and impacts on the community and environment and installing infrastructure for tolls would take several years, according to the state transportation department.